While cash registers may have a quaint antiquity about them, there are much better options these days. In today’s largely digital world, using current technology is a must if you want to just keep up with your competitors, let alone surpass them. Fortunately, implementing a modern POS system is surprisingly affordable and easy. While the cash register may seem like the easier option, simplicity isn’t your friend in this scenario. Today’s POS systems do so much more than just facilitate transactions. Once you start using features like the ability for employees to clock in and out, suggested purchases, employee incentives, and payroll, timesheet, and inventory management, you’ll wonder how you ever got by without your POS system. Many POS systems are all-inclusive software packages that include everything you need to keep your store in business. The right POS system allows you to streamline your business and cut unnecessary spending. The days of paper are over. Instead of loading a massive file cabinet with documents, why not store your data digitally? There are plenty of backup and security options to keep your data safe, and storing your essential information online or in the cloud makes accessing, referencing, and editing it as needed a quick and easy process. POS systems provide data that empowers you to make smart business choices. For example, let’s say you have one product that’s flying off the shelves, your POS system can recommend that you order more before you run out. Or, let’s say you have a product that’s been collecting dust for the past month or two. Your POS system can let you know so you can lower the price, or cancel your next order. Some modern POS systems include employee incentives programs that allow you to reward exceptional staff members. You can also use data to see which employees are performing best, and which could use more training. A POS system streamlines the checking out process, ensuring a fast transaction for your guests. Time is money. In a retail setting, time also relates directly with customer satisfaction. After all, if someone has to wait in line for a half hour to buy a product, they probably won’t be back. With ecommerce becoming increasingly common, providing an outstanding in-store experience is more important than ever. If a cash register goes down, it’s going to be out of commission for at least a few days, and that’s if you’re even able to find someone to repair it. On the other hand, POS systems are less likely to fail, and troubleshooting them is as easy as making a phone call or going online. If worse comes to worse and you need a physical repair, you’ll have no problem finding a technician. POS systems are capable of storing customer data, and that information makes it possible to cater specifically to their needs. For example, at a restaurant, you can look up your customer’s past orders, and suggest similar foods or drinks that they might appreciate. Or, at a clothing store, your employees can suggest specific fashions, in the right size based on past purchases. Your POS system is like a rolodex of your customer’s buying habits – that’s an incredibly valuable tool to have at your disposal. With a POS system, everything is clearly laid out in front of you. Need to split a check? No problem. Need to do a partial payment? Just press a button. Cash registers can be difficult to use, if the features you need are even available at all. Often attempts to solve a problem results in the creation more problems. POS systems reduce mistakes. POS systems also reduce counting errors, and they have features that allow you to see where, when, and how mistakes were made. Whether you want to review sales reports at home on the couch, or you want to sell your products at a tent sale, a POS system makes it possible. Some of today’s cloud-based POS systems can be used offline on a mobile device, so you can set up business from virtually anywhere. You can’t toss your cash register into your carryon bag! 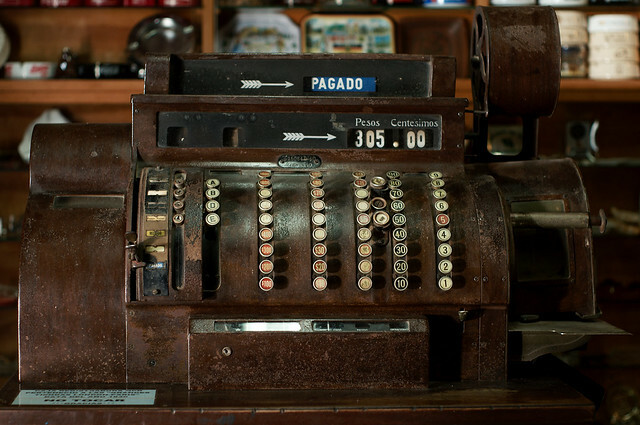 It’s clear that POS systems have plenty of advantages over the obsolete cash register. If you’re still relying on cash registers, shop around. You’ll be surprised by how affordable good POS software can be. Make sure you get to know the in-depth features of your software. The long-term results are worth it. Jhay Thomas is a marketing expert with nearly 10 years of experience writing about growth strategies for startups and small businesses. He also works as a commercial technology consultant to develop an improved iPad POS system.